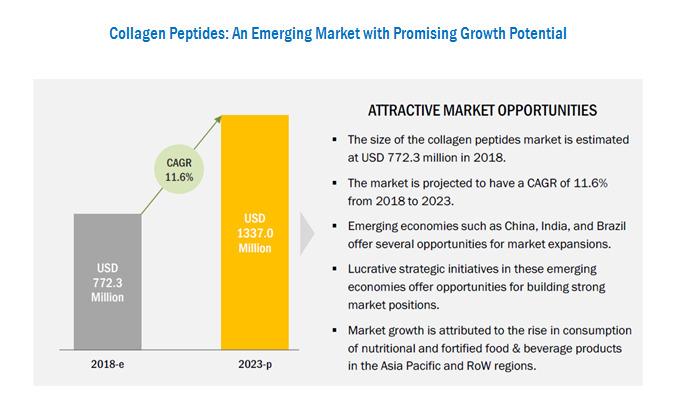 [120 Pages Report] The global collagen peptides market was valued at USD 716.5 million in 2017; this is projected to grow at a CAGR of 11.6% from 2018, to reach USD 1,337.0 million by 2023. The objectives of the report are to define, segment, and estimate the size of the global collagen peptides market. Furthermore, the collagen peptides market has been segmented on the basis of source, application, and region. The report also aims to provide detailed information about the crucial factors influencing the growth of the collagen peptides market, strategical analysis of the micromarkets, opportunities for stakeholders, details of the competitive landscape, and profiles of the key players, with respect to their market shares and competencies. This research study involved the extensive use of secondary sources (which included directories and databases) such as Hoovers, Forbes, Bloomberg Businessweek, and Factiva to identify and collect information useful for this technical, market-oriented, and commercial study of the collagen peptides market. The primary sources that were involved include industry experts from the core and related industries and preferred suppliers, dealers, manufacturers, alliances, standards & certification organizations from companies, and organizations related to all segments of this industry’s value chain. In-depth interviews were conducted with various primary respondents such as key industry participants, subject matter experts, C-level executives of key market players, and industry consultants to obtain and verify critical qualitative and quantitative information as well as to assess future prospects. The following figure depicts the collagen peptides market research methodology applied in drafting this report on the collagen peptides market. The key manufacturers in the collagen peptides market include Darling Ingredients (US), Tessenderlo Group (Belgium), Cargill (US), Kewpie Corporation (Japan), and Danish Crown (Denmark). These companies have diversified product portfolios and advanced technologies for collagen peptides at major strategic locations. Other companies profiled include GELNEX (Brazil), GELITA AG (Germany), ITAGELATINE S.p.A (Italy), Lapi Gelatine (Italy), Nitta Gelatin (Japan), Weishardt Group (France), and Junca Gelatines (Spain). Over the last few years, consumer awareness about healthy food products has been fueling the collagen peptides market for nutritive food products. Consumers are increasingly focusing on healthy aging, not only to increase their life expectancy but also to prevent and postpone the onset of diet- and bone-related diseases. According to the International Osteoporosis Foundation (IOF), osteoporosis causes more than 8.9 million fractures annually, in which roughly translates to an osteoporotic fracture every three seconds, globally. According to another study conducted by IOF, it is predicted that the number of Chinese population with osteoporosis and osteopenia will increase to 286.6 million by 2020 and 533.3 million by 2050. The incidences of hip fracture has already risen two to threefold in most Asian countries during the past 30 years. By 2050, more than 50% of all osteoporotic fractures will occur in Asia. The growth in health consciousness among consumers due to awareness regarding various diseases, nutritional deficiency, and desire for healthy aging, among other factors, has resulted in increased consumer demand for functional and fortified food & beverage products. The increased consumer understanding about nutrition has led to the demand for food products with specific functionalities that will cater to their needs and aid in dealing with different health aspects. Collagen hydrolysate or collagen peptide has wide usage in the areas of culinary and food processing sectors. It is mixed in various drinks, shakes, smoothies, and ice creams to give an anti-inflammatory protein boost, as the ingredient has the tendency to dissolve in the cold liquid easily. Hydrolyzed collagen has good organoleptic properties, taste, and is odor-free, while at the same time enabling the food product to maintain its quality. It is used in various formulations due to its property to mix and blend with other forms. Consumers are becoming anxious about the safety of the food and food ingredients that they consume. The various processing technologies, preservation techniques, and packaging methods remain important safety issues. Therefore, several food additive laws and regulations have been implemented in various countries, thereby limiting the growth and usage of hydrolyzed collagen substances. Hydrolyzed collagen is obtained from animal sources, such as fish, pigskin, and bovine. There is rapid opposition against the usage of products obtained from animal sources, keeping in view the conservation of wildlife. Vegan food has become the latest trend in developed countries, such as in the US. In addition, there is a probability of shortage of resources in some places to meet the demand for these products, which, in turn, would create a supply-demand imbalance. Darling Ingredients completed the acquisition of Kruger Commodities, Inc. (US). This helped the company to expand its production business for protein blending operations and its cooking oil collecting business. Darling Ingredients has launched a new product named StabiCaps. It will help the company to expand its collagen peptide product line. The company launched SOLUGEL Ultra BD in the collagen protein market to expand its product portfolio. 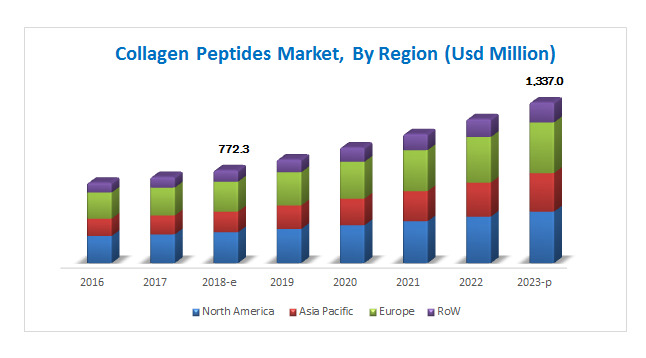 The collagen peptides market is projected to reach USD 1,337.0 million by 2023, from USD 772.3 million in 2018, growing at a CAGR of 11.6%. Wide application of collagen peptides as a functional ingredient in food processing and rising consumer inclination toward healthy lifestyles act as factors driving the collagen peptides market growth. Based on the source, the collagen peptides market has been segmented into cattle hide & bones, pigskin, and poultry & fish. The pigskin segment dominated the collagen peptides market in 2018, and this trend is projected to continue through the forecast period from 2018 to 2023. Different methods are used to extract collagen protein, which include the salting out, alkaline, acid, and enzyme methods. Extraction of collagen peptide from pigskin is generally done through acid method, wherein citric acid is used. On the basis of application, the collagen peptides market has been segmented into nutritional products, beverages, dairy products, snacks & cereal, meat & poultry products, and others. The nutritional products segment dominated the global collagen peptides market in 2018. Among all the nutritional ingredients used in sports nutrition products, proteins play an essential role. They help in improving athletic performance, protecting joints and connective tissues, muscle restoration, aiding muscular contraction, weight management, and also helps to reduce the risk of injury. Collagen peptides are considered as a major source of protein that originates from collagen. North America is expected to account for the largest share of the global collagen peptides market through 2023, owing to the flourishing food & beverage industry in the region. The region is the largest producer and consumer of processed food & beverage products. The major factors driving the collagen peptides market in North America are the rise in health awareness among consumers and presence of key players such as Darling Ingredients (US) and Cargill (US) in the collagen peptides market. Asia Pacific is projected to be the fastest-growing region in the global collagen peptides market during the forecast period, owing to the rising consumer awareness about the health benefits of low-calorie and low-fat nutritional food & beverage products. Stringent food laws for animal-sourced additives and concern toward the depletion of animal sources are some of the major factors restraining the growth of the collagen peptides market, globally. Consumers are growing increasingly concerned about the safety of the food and the food ingredients that they consume. The various processing technologies, preservation techniques, and packaging methods remain important safety issues. Therefore, several food additive laws and regulations have been implemented in various countries, thereby limiting the growth and usage of hydrolyzed collagen substances. The key players in the global collagen peptides market include Darling Ingredients (US), Tessenderlo Group (Belgium), Cargill (US), Kewpie Corporation (Japan), Danish Crown (Denmark), GELNEX (Brazil), GELITA AG (Germany), ITAGELATINE S.p.A (Italy), Lapi Gelatine (Italy), Nitta Gelatin (Japan), Weishardt Group (France), and Junca Gelatines (Spain). Increase in the population of working women and dominance of nuclear double-income families, especially in urban areas, are trends that shape the changing lifestyles of a majority of consumers and their approach toward healthy lifestyles in emerging economies. Rise in living standards and changes in lifestyles in developing countries contribute to the development of the convenience food market. The collagen peptides market, therefore, is estimated to possess greater potential in newer and untapped markets of China, India, Japan, Brazil, and the Middle East. An unhealthy diet is one of the key risk factors for non-communicable diseases (NCDs). Inadequate consumption of essential nutrients increases the risk of various chronic and cardiovascular diseases such as hypertension (high blood pressure), cancer, obesity, and diabetes. With globalization and higher exposure to other cultures (especially Western lifestyles), consumers’ eating patterns have also changed, with an increase in snacking and eating meals in restaurants. The saturated markets of developed economies compel manufacturers of collagen peptides to search for untapped markets and new consumer bases. This requires substantial investments in many aspects of business expansion, especially when it comes to the establishment of new facilities, such as distribution channels in developing countries. The extraction and processing of collagen peptides requires highly advanced technology which is not largely developed throughout the regions of the world, especially in developing countries such as India, China, and rest of the Asia Pacific countries. Hence, the production of collagen peptides is largely restricted to some countries, such as the US, UK, and Germany. Cargill opened its first fish feed plant in India by improving the fish feed capacity for farmers. This will help to improve the aqua feed business in India and across Asia. Nitta Gelatin entered into a partnership with Vyse Gelatin (Chicago). This partnership helped the company to expand its collagen peptide product portfolio and capabilities. Good information for us. Thanks for sharing this article..